Over the last few years there has been an enormous increase in ‘single use throwaway items’ that not just have an impact on the environment but also our purse. I like the idea of more self sufficiency, of reducing costs and living more simply, it is the smallest things that make a difference. It also gives me a little satisfaction in believing that I can help the environment. When I was removing my make-up the other day I noticed that the cotton wool balls I reach for, were getting low. I decided to seek out an alternative that could be reused time and time again. I like the idea of something pretty and useful – sewing is my first love so I decided to investigate making little make up removers using Terry bowling and left over scraps and some pretty crochet cotton. Cut a circle of scrap fabric and another circle a little bit smaller out of Terry towelling. It is more cost effective to use a face flannel as they are cheaper than purchasing towelling by the metre. I had this green towelling in my stash so I used it, but the quality was not as good as I would have liked. Simply stitch the two circles together, turning a tiny seam allowance as you go. Then use blanket stitch all round the edge followed by a single crochet trim. The pads were very effective – it takes only a few minutes to wash them under the tap and leave to dry. However, I did find the quality of my towelling meant the pads were a little scratchy, best for exfoliating rather than make up removal. The second experiment was with a cotton wadding – it seemed to have a similar softness of cotton wool balls but when it was washed it began to bobble – so it wasn’t going to last through repeated washes. So I turned to a crochet version using lovely fluffy wool called ‘coats virtuoso’ – they look pretty similar to cotton wool balls and feel delightfully soft. This one is made by creating a 6 chain, then inserting two double crochets in each space, to increase the second round, followed by two treble crochets in each stitch in the third round. 2nd round 12 single crochet into ring. 4th round, 2 single crochet into each stitch. finish and weave in loose ends. As you can see the ‘alternative cotton wool ball’ looks very similar, and is delightfully soft to the skin. I used coats Virtuoso – it is a chenille type of cotton – that has just the right amount of fluffiness and is not too expensive. The downside is that it is so fluffy you can’t easily find your stitches, but it doesn’t really show in the finished ‘alternative cotton wool ball’. As it is 100 percent cotton these alternative cotton wool balls can be washed at a high temperature. I would recommend giving them a good wash and then letting them sit in boiling water for about 10 – 20 minutes every now and then to keep them sterilised. They are very soft, and unlike real cotton wool balls – they don’t push fibres into your face and they can be re-used time and time again. They are so quick to do – you can have a whole pile made in less than an hour. I don’t know about you, but I simply adore vintage linens. I have a piles of white doilies and placemats as well as pretty tea trays and tablecloths. I love the romantic notion of eating meals on white crisp linen, and have even used pretty napkins – until I saw someone spread the delicate white with tomato sauce! I came across the delightful embroidery of gentlework on Pinterest and followed the link to her inspirational blog. What bliss! The soulful embroidery made me feel inspired to make a little message of my own. I had felt rather poorly in the last few weeks, and a little burnt out so I decided to make a little wall hanging. I discovered a pack of lace pieces in a bag in a charity shop a few years ago – I snapped them up. Despite having piles of linen I simply cannot bring myself to cut them up but this time someone had already done this for me. The linen was white and fresh, it felt like sacrilege to age it so I left it white. I wrote the words using a blue wash away pen. 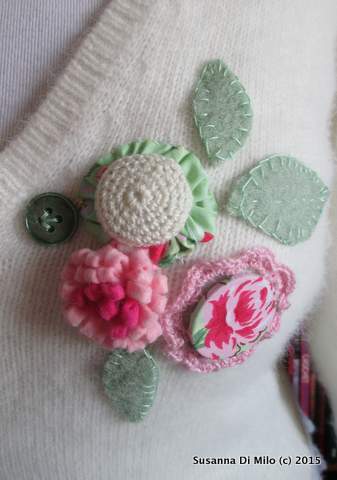 I added a few more embroidered flowers – daisy stitches and button hole rounds. The whole thing was approximately 6 inches wide by 10 inches long. I used variegated thread for the word rest, but I could not decide how to do the all is well. I had to re-write it as the writing was too small to embroider effectively. The word ‘is’ ended up lost, so I whipped stitched it. I kept on unpicking and re doing – in the end I decided the pink was too pale. I had a lovely piece of scalloped edging which I used to connect the top piece – it was a little different in colour, but I liked the effect. I then quilted it with various stitches using white Perle – I loved the way they created texture without detracting from the coloured embroidery. I crocheted an edge and decided to add tassels – it gave the quilt a little weight to change better. It is rare that I allow myself to simply play around – but it was enjoyable letting the little quilt evolve. I didn’t like the ‘All is Well’ part. I think next time I will use cotton Perle quite thick rather than embroidery floss. It has been a soothing exercise, and quite addictive! Long wintery nights are just perfect for simple projects to keep fingers busy while watching a good film or TV box set. When I am settling down in front of the TV I seem to need something to do, so when I spotted this beautiful ball of wall in the delightful Boutique Woolery in Fareham I could not resist the way the colours faded into each other. I decided it needed the simplest of stitches so make the most of the colour variation, originally designed for a scarf pattern so I played with the width to find a way accommodate the flow of one shade to the next without a big leap of colour. I thought I would make a baby blanket for a lovely 18month old boy – the teal and grey colour is very on trend at the moment so it compliments his mother’s sofa. Hopefully she will love it, I always think blankets of this size are handy for when baby drops off to sleep you can just snuggle it around them to keep them cosy. Treble stitch was just right to give stretch the single crochet edge gave structure to the shape; it was delightful to see how the trebles created a ripple effect throughout the blanket. I like simplicity – when I am watching tv I find it hard to concentrate on the stitching – so it was nice just to let my fingers work away without having to count. I did have to divide the wool into colours to be able to get the right stripes around the edge, but the main blanket was one continuous strand. I used two balls of Sirdar Colourwheel wool for to create the blanket, they do have a beautiful rainbow coloured one that looks lovely. The wool was a pleasure to work with, no splitting – and it is soft to the touch. So here is the finished project all blocked up ready to go! I hope she likes it. This is my beautiful grand-daughter Effie. I began making a baby blanket when my daughter told me she was expecting – as you can see she is nearly three months old, but I am glad to say the blanket is finally finished! 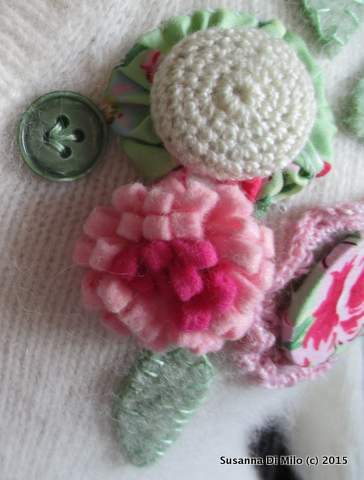 I used baby bamboo cotton – I loved all the lovely mix of colours and it is practical it can be washed easily. I used several different stitch combinations – making up each row as I went along. I liked the combination of triple stitches, shells and trebles. One thing I did discover is that my tension varies! One side grew a little more than the other and I ended up with a rather odd shaped rectangle. I added a single crochet border to add stability and it brought the tension under control. She seems to like it! 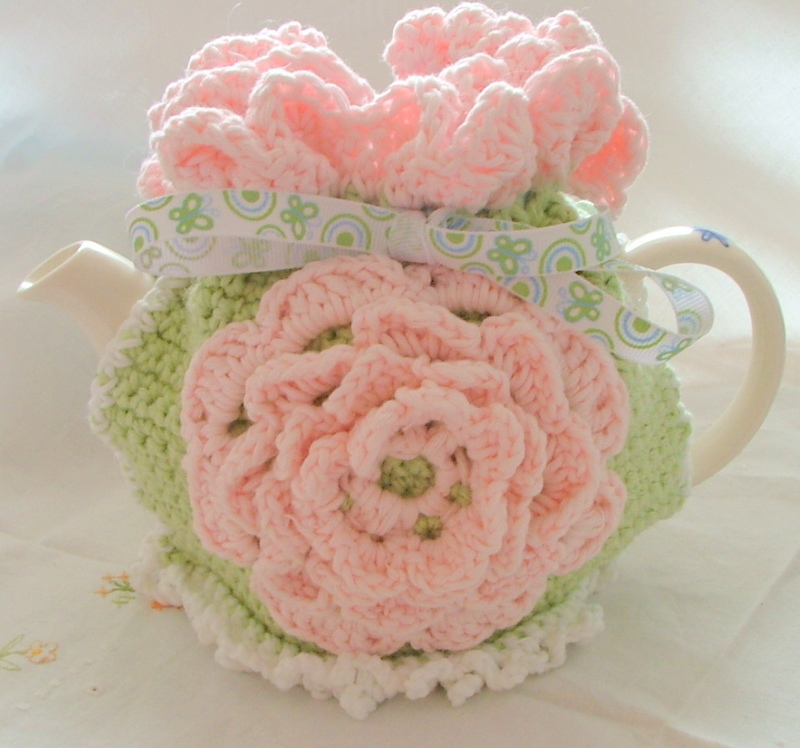 My love is like a red, red rose…tea cosy! This is my latest crochet project… its a completely made up pattern, because I find following a pattern the equivalent of doing someone else’s algebra homework! When I was a child I had a beautiful tea set, with cups and saucers, a pretty matching milk jug and a lovely full bellied tea pot. Never, in living memory, did I ever play with a few mugs and a kettle! So it is no surprise that I am somewhat of a tea lover and a bit of a tea snob – I like leaf tea in a pot! One of the many little things I missed – (when our house move fell through and everything… I mean everything went into storage) was our lovely big tea pot that my grandma gave me as a wedding present …over thirty years ago! (oh my! now I feel old) Given that we have three large containers full to the brim with boxes it was easier to be on the look out for a new one, than spend hours rummaging – plus visiting the storage yard, just makes me sad. The wool has a delightful tiny streak of glitter – Mayfield Yarn, called Sparkle Baby, that gorgeous vintage shade – a mixture of green/blue that works so well with the deep red, which is – (sit up straight now) from the WI Brand. Both were lovely to crochet with. It might seem a little odd, but I am actually quite lazy, the great thing about making tea in a huge blue tea pot is that you can keep going back for more with the same effort it takes to make one cup! Mr D, struggles to get his porkie pinkies into a delicate tea cup, so he has a manly mug, while I play, with girlie delight, use a delicate cup and saucer – half the size of his – hence I go back more than once! I love the pretty basket cosies with flowers on the top so decided to make one of my own, it is a very easy pattern. I find knitting hard on my hands so found a delightful youtube video on how to do a crochet basket stitch, it is quite a thick chunky stitch providing good insulation. The roses, too, are crochet, but in one long strip and rolled together – and they look so lovely. I made a little crochet button and button hole to go round the base, just to bring it together and to encourage Mr D to use it. (he hates fiddling around with cosies – so it had to be easy to slip on and off). I am not sure how I managed it, but my roses are all ready for Valentines Day… of course it is all perfectly planned. 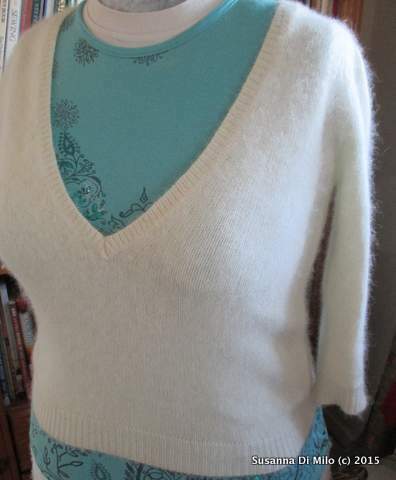 This lovely Angora Jumper was needing a little brightening up. To make this into a cardigan I cut along the midpoint between the rows of stitching. It is important to finish the edges before it began to fray. 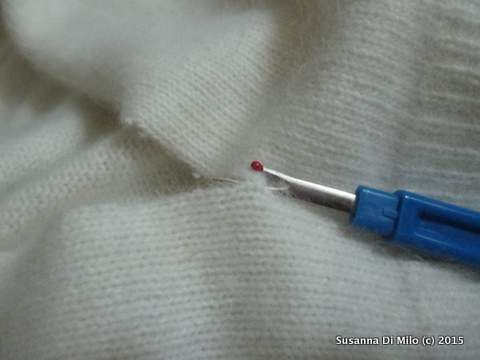 Use running stitch around the edge and then pull together so that the fabric gathers around the back. 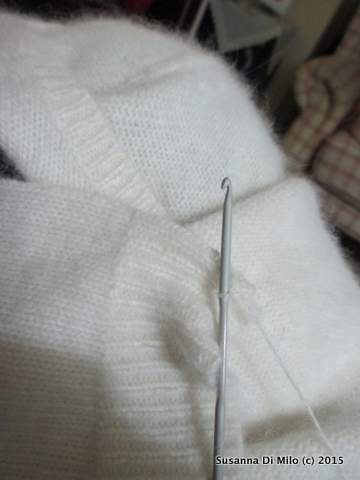 I use snap fasteners, to close the cardigan it makes it easy to fasten. The rose was a felted button and the leaves were from a wool blanket I felted and dyed. I hope my daughter enjoys her new vintage style cardigan. I find that wool shops can be like stepping into an artists palette, the colours and hues really do excite me. There seems to be an endless variety of textures as well as colours and after years of seeing haberdasheries and wool shops disappearing, the new wave of knitters and hookers has seen an upsurge in new wool varieties, merino and alpaca as well as denim, but I have a liking for cotton type wool and this is called baby bamboo. Choosing colour is difficult for some people they are daunted by the sheer magnitude but I find if you look at a range you will find that the shades and colours have a harmony. Such was the case with this, there were a beautiful palette of the baby colours, blues, yellows as well as greens. The pink has come out in this picture a lot brighter than it is naturally it is lovely. Very soft to work with and gentle on the hands. I have a sweet little tea pot, from Whittards, its lovely blue and white but was being swamped under tea cosies made for stouter pots! I felt it was small enough to practise on! I wanted to learn to crochet but I have a terrible problem understanding practical things from books, I wish I had let my Nan show me when she wanted to, she made the most wonderful bed covers using the granny square! Since she could not show me, I did the next best thing and I took myself off to a local WI where a lovely lady kindly showed me the basics. I was then able to decipher the books and learn new stitches, but I still struggle to follow patterns! So this is my little journey into playing with various stitches, made from two straight easy pieces of plain crochet and some practice frills. The roses were great fun, as usual I went off the pattern to create my own rose but I was pleased with the results. Crochet is so much more free form than knitting, you can make holes, add frills or simply pull and it will all come undone and you can start again. It really is the most forgiving wonderful craft.